FunnelModifier for the component that you can attach to objects to use the funnel algorithm. Calculate the shortest path through the funnel. The portals of the funnel. The first and last vertices portals must be single points (so for example left == right). If true, then a vertex will be inserted every time the path crosses a portal instead of only at the corners of the path. The result will have exactly one vertex per portal if this is enabled. 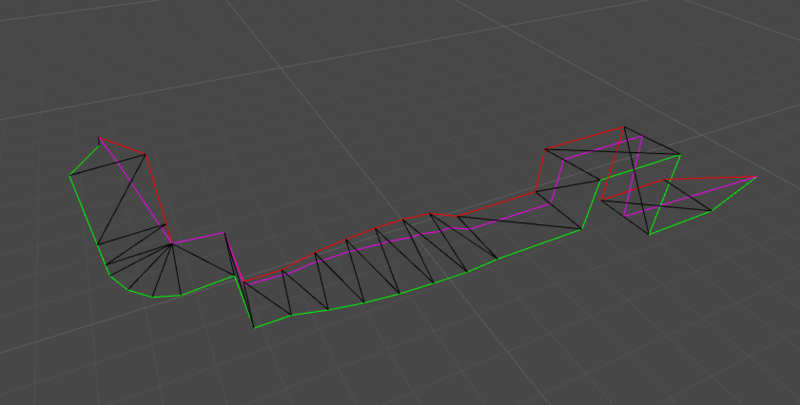 This may introduce vertices with the same position in the output (esp. in corners where many portals meet). Unwraps the funnel portals from 3D space to 2D space. The result is stored in the left and right arrays which must be at least as large as the funnel.left and funnel.right lists. The input is a funnel like in the image below. It may be rotated and twisted. The output will be a funnel in 2D space like in the image below. All twists and bends will have been straightened out. Try to fix degenerate or invalid funnels. The number of vertices at the start of both arrays that should be ignored or -1 if the algorithm failed. True if b is to the left of or on the line from (0,0) to a. True if b is to the right of or on the line from (0,0) to a.